CN77000 Micro-Infinity Series are discontinued. As a possible substitute, please check out the CNPT Controller for details. High accuracy, high quality MICROMEGA™ controllers offer unparalleled flexibility in process control. Each unit allows the user to select the input type, from 10 thermocouple types (J, K, T, E, R, S, B, C, N and J DIN), Pt RTD's (100, 500 or 1000 ohm, with either 385 or 392 curve), or analog voltage or current input. The voltage/current inputs are fully scalable to engineering units, with selectable decimal point, perfect for use with pressure, flow or other process input. 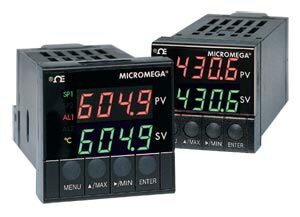 The MICROMEGA™ controller features a large, dual LED display, front panel configuration, selectable temperature/ process inputs and universal power supply that accepts 90 to 250 Vac or Vdc. Available in single and dual output configurations, the CN77000 Series is available with relay, SSR, dc pulse, analog voltage or current outputs. A single alarm is standard. Options include a second alarm, RS-232, RS-485, analog output or remote setpoint selection. The CN77300 series controllers have many features of larger, 1/4 DIN controllers in a compact, 1/16 DIN size. These controllers feature a 1/16 DIN cutout and bezel with a NEMA-12 rating, dual LED displays, with different colors for the actual process and setpoint values. Individual indicators provide output and alarm status. The CN77500 series features a 1/16 DIN cutout, 53.3 mm (2.1") square face with NEMA-4 rating, large dual LED display, front panel configuration, and selectable temperature/ process inputs. Available in single and dual output configurations, the CN77500 is available with relay, SSR, dc pulse, analog voltage or current outputs. A single alarm is standard. The CN77R300 and CN77R500 series controllers feature a unique detachable display and adapter to allow mounting in a round, 44 mm (1.75") cutout. This feature allows users to prepare the panel with a standard round hole saw. The 2-piece design snaps together, for quick, easy installation.